For some developers it doesn’t make sense to spend a lot of time and money into porting something, when the income gained from it may not come close to their expenses, and we should be okay with that. As I’ve stated before, many times, we are still a tiny platform. For a game as heavy as Arma 3, it may not even be possible to do it non-native, and they realise this. Quote Insights into our Steam configuration have fueled some speculation that we'd like to clarify here and now. 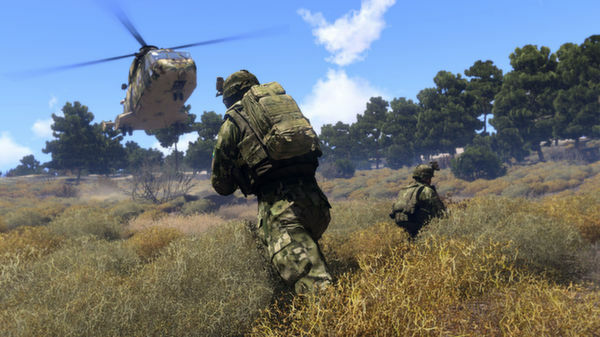 We are indeed experimenting with 2 ports of Arma 3. An external team has been investigating whether it would be possible to create (non-native) client ports to Linux and MacOS. Being external, this does not affect the core development team while it focuses on the Expansion. We should make it really clear that at this stage there are still very many uncertainties. We do not yet know when we'd release these, what their update cycle would be like, or any other specifics. In fact, it's still possible these ports will never see the light of day. There are several technical and licensing challenges to overcome. But, the chances of such ports have gone up from 0% for Arma 3. We'll be sharing more when we can! How do you feel about this? No word on who it will be, but we have a good idea. I too don't care if it's native or not. I just want it to have a decent performance. I don't know if I'm going to buy this one however, my hardware is pretty outdated and I don't think it can handle such as game even natively on Windows. Well, may be is not the best of the news, but at least is something. Being considered for a port is by it self a very good new, so it's OK for me, because somehow I tend to think that in future games portability will be something built from the ground up, and out of any kind of argument, not something to take into consideration just if it fills up. What is meant with native in this case? That it is not supported by BI or what? As I suspected, VP might indeed be behind this, I don't have much of a problem with this anyway, it's better than nothing after all. How unfortunate. I would prefer that devs at least try to mess around with Linux instead of outsourcing, doubly so if it's a non-native port we're talking about. At the very least, it builds experience in-house which can then be applied to future games and content. Techland's presentation on porting clearly showed that things would have been easier if the porters (and Linux) had been part of the main development process instead of having to deal with whatever changes the rest of the programmers thrust upon them and playing catch up. I can only imagine how much harder the work of the external studio will be in keeping the game updated and running well. Given the generally resource-heavy nature of ArmA I can't say I have much hope for this experiment of theirs. As liam points out, we're a tiny fraction of the market but it's still a very chicken and egg sort of situation despite the good things Valve has done for us. Market share is a great motivator in getting developers to port to us but I think that so is experience with the OS in general. The Techland guys seemed to be happy with their overall experience on Linux and I think that they'll push for their bosses/colleagues to integrate Linux into their workflow because of that experience. If more developers were familiarized with the environment things would definitely be easier for us Linux gamers. But, ah, maybe I'm showing too much wishful thinking on that last point. So an windows unoptimized game will come to linux inside a wrapper than will make it to loose performance, to run on unoptimized graphic drivers on an OS where it was never optimized to run. I have enough native games in my library and over 30 more native games on my wishlist that I will purchase and play at some point. I don't have the time or the money for games that aren't native. This makes me excited because maybe DayZ will make it over. Very honest and clear reply. i wish more devs were as forthcoming about their future plans. Hopefully it pans out and well get to play it on Linux.